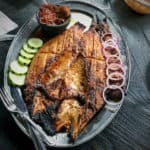 The recipe for zarandeado fish is one of the most emblematic of Mexican cuisine with fish and seafood. This dish is a classic on almost all the coasts of the country, with small variations, depending on the region where it is cooked. The shaken fish can be prepared both in the oven and on the grill. In this case, we will make the preparation to the oven. The most common to prepare this recipe, is to use fish such as red snapper, dorado or the snapper. You can also use the grouper, the sea bass, the bonito, the sole, a good curvina or a pompano. Cooking recipe to prepare, step by step, a fish tossed like those of the best inns of the Mexican beaches.We will do this for the sole purpose of facilitating the work of the food processor or blender. We will process the pieces of onion, garlic and juice from the lemons in the robot or blender. With the sauce obtained, we will completely coat or varnish our fish. To continue, we will chop the other half of the onion in julienne. We will also wash the chili and chop it in rajas, after having removed the head, seeds and white parts. We will reserve it momentarily. In a cup, we will mix half a tablespoon of mustard, the Same measure of mayonnaise, a few drops of soy sauce, English sauce and maggi juice. We will cover the fish with this mixture and then with the onion and chili. Finally, cover with aluminum foil and cook in the oven for 20 minutes. That's it. 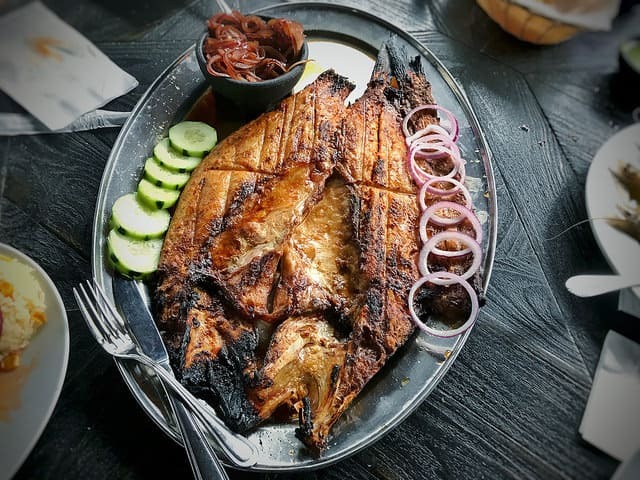 After this time, the zarandeado fish will be ready to eat. To prepare the fish tossed in this way, place a sheet of aluminum foil between two roasting grills. The fish can be seasoned in the same way as we explained in the recipe to the oven, and placed on aluminum foil with the skin facing down. The fish should be grilled between the two grills or in a press for Roast for 20 minutes. Preferably, the best thing to do is to grill it for the first 10 minutes on the side of the meat and the rest of the time on the other side. All this, with the low flames. There are also those who, before preparing the mixture of onions, garlic and lemon, fry the garlic cloves and then crush them to obtain a puree. If you want to get a spicy fish, you can add guajillo chili to the garlic, lemon and onion mixture. Optionally, you can add a little ketchup or hot sauce (or both) to the mixture of mayonnaise and mustard. For this recipe to be well, it is essential to use fresh fish. If that is not the case, the result will never be the same. You can decorate the shaken fish with more vegetables, like cucumber wheels or onion wheels (more onions! ), For example.